The Acheson Prize is awarded for original, unpublished undergraduate essays on international questions broadly understood. Named for Dean Gooderham Acheson, Class of 1915, the prize is awarded annually by the Yale Review of International Studies, with support from International Security Studies. 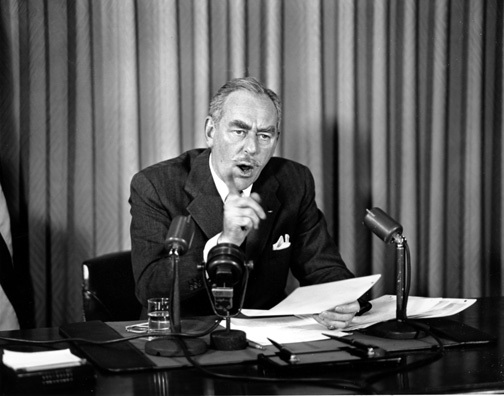 Mr. Acheson served as Secretary of State from 1949 to 1953. Following his tenure at the State Department, he served on the Yale Corporation. In 1970, he won the Pulitzer Prize in History for his memoir, Present at the Creation: My Years in the State Department. This prize honors Acheson’s legacy as a thinker, scholar, and public servant. The following five finalists published distinguished themselves among a truly excellent pool of over 100 submissions. The essays are published in the Acheson Prize issue (Vol. 7, Issue 3) of the Review, as well as online. Charles Hill is a Distinguished Fellow of International Security Studies at Yale. Jolyon Howorth is the Jean Monnet Professor of European Politics at the University of Bath. Jean Krasno is a Distinguished Fellow of International Security Studies at Yale. Michele L. Malvesti is a Senior Fellow at Yale’s Jackson Institute for Global Affairs. Amanda Behm is the Associate Director of International Security Studies at Yale. Are you interested in submitting to the next issue of YRIS? See our submission guidelines here.